"...This year's Mini Cooper buyers expecting to find a lower-priced used 2007 Mini were in for a big surprise. They paid, on average, $2300 more for a used Mini in mid-June, a 12% increase over the average transaction price on Jan. 1 of this year..."
"Dominating the list of 15 fuel-efficient used cars making a comeback is the Mini Cooper with four model years, including 2005 ($1,900 average transaction price increase, or 11%); 2006 ($1,600 average transaction price increase, or 10%); and 2004 ($1,050 average transaction price increase, or 7.4%)..."
Yeah, I had to include that part in there too. But in all fairness, its not all about the MINI. Check out the entire article for some jaw-dropping, cork-popping numbers! Well, I guess that depends on what you drive. Can a Hornet sting the MINI? A few articles I ran across today question if the Dodge Hornet (concept) is specifically aimed at taking a piece of the MINI Cooper market. "We wanted the Hornet to be dynamic, nimble, fun to drive, and have an adaptable space-efficient interior," said Mark Moushegian, Principal Exterior Designer. "At the same time we set out to create a vehicle with a uniquely American character to expand the image and presence of the Dodge brand in Europe and international markets, especially in the entry-level market." Underhood is a 1.6L 16-valve OHC supercharged I/C four-cylinder engine putting out 127 kW (170 hp)/224 N•m (165 lb.-ft.) of torque @ 4000 rpm. My two cents? Um, just look at that front end. And the back end. And the interior. Form your own opinion by reading the articles in full at the links below! When the eBay auction closed on June 15th, some lucky Austrian fella (or fraulein) became the proud owner of the one-of-a-kind Life Ball MINI 2008 by Agent Provocateur. Closing at 45,000 Euros (equiv. $69,700 USD), that's a pretty good deal for a custom MINI Cooper Clubman! In addition to the hand-stitched leather interior, custom graphics and paint and of course, bragging rights- proceeds from this auction go toward international AIDS charities, which is a pretty cool statement right there! The winning bidder will also receive two VIP tickets, including overnight accommodation, for the MINI Challenge Finale on 27 September 2008 at the Salzburgring race track. Not a bad deal for 70 grand! I would certainly take it over a 7-Series any day! "I get good comments like 'that can't be stock!' 'what do you have in that thing?' I'm pretty sure most of those guys think I'm a liar. My answer always is 'look at the ride height, if It wasn't stock would I have it riding so high' ..."
Norcal UFO Autox 2007 Mini Cooper S from Brendan on Vimeo. Auto-blog site, Cars.com reports that 900,000 people went to miniusa.com in May 2008?! "Maybe it was the recent introduction of the Clubman, but MINI is saying, nope, it’s high fuel prices that have driven traffic to its website to increase nearly 90%. Last month, more than 900,000 people went to miniusa.com to check out the Cooper lineup. Searches for new Mini Coopers were also up on Cars.com, nearly 40% in May compared to April 2008." The article continues on to cite mileage estimates in comparison to other cars in the same class. Friends of "Bushfinger MINI" will recall more realistic, real-world mileage statistics conducted by yours truly! Thinkgeek.com is one of my favorite sites to look at stuff I'll never buy. I might actually buy this thumb-sized R/C MINI Cooper though! Cars.com asks, "Which MINI is best for Suburban Dads?" Cars.com's Patrick Olsen compares the 2008 Mini Cooper S, Cooper Clubman and Cooper S Clubman to see which one is the best for a suburban dad. Clubman, xB, and Smart ForTwo- compared? 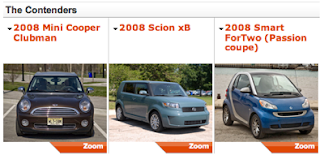 Tell me Cars.com did not just compare the 2008 model MINI Cooper Clubman, Scion xB, and Smart ForTwo?! "Some cars are merely popular, like the Toyota Camry, while others have a rabid following in which the car is more than just a car. The three cars below fall into the latter category, and we're here to see which has the best odds to win over the hearts and minds of its owners." Okay- I'll accept that. With categories like "Biggest head-turner" and "Cabin aesthetics", this is not your typical comparison. And the results may astound you! Visit Cars.com for a complete, and admittingly- quite unique look at three otherwise totally uncomparible 2008 models. Yep, again with the Agent Provocateur MINI... but, it's so hot! Or is it the women? The Life Ball MINI is traditionally designed by the fashion designer to whom the fashion show at the opening event is dedicated - in 2008 this was the English lingerie label Agent Provocateur. The starting point chosen for the exclusive one-off design was the new MINI Clubman. Agent Provocateur, founded by Serena Rees and her husband Joseph Corre, son of fashion doyenne Vivienne Westwood, is known for its wicked, burlesque collections - and this year’s Life Ball MINIM was designed accordingly. "We really enjoyed giving the MINI Clubman our unique brand look. The new shape of the MINI is so reminiscent of the old Mini police car that we immediately came up with the idea of giving the interior a makeover in the Agent Provocateur style, so that you’d actually want to be arrested. The classic exterior has been pepped up a little, using the Agent Provocateur signature colours of Pink and Black and finished off with a pink flashing light. Inside there is a truly seductive prison cell which is fitted out with leather loops as manacles that are attached directly to the walls, as well as mirrored windows and metallic prison bars. "Always under the assumption that the long arm of the law requires plenty of space when questioning a prisoner, we fitted our Agent Provocateur police MINI Van with couch seats in the back and leg restraints for forensic examinations. The quilted leather seats and tailor-made compartments for notebook and pen, the Agent Provocateur MINI police car is the perfect vehicle for finding a criminal’s hidden treasures, don’t you think?" says Joseph Corre, founder of lingerie label Agent Provocateur. The designer MINI 2008 made its debut in front of 40,000 spectators at this year’s Life Ball in Vienna’s town hall square. Escorted by four models, with Joseph Corre at the wheel and Sophie Ellis Bextor as the front-seat passenger, the Life Ball MINI 2008 opened the fantastic show on Vienna’s town hall square.